When it comes to getting crafty, you’re going to love working with crystal cube beads. These unique Swarovski cubes make for a great way to add character to any piece of jewelry, and they are often seen on necklaces, bracelets and even earrings. Is your project or piece of jewelry looking for accents that add a contemporary look? If so, you'll love the Swarovski 5601 cubes. In fact, these beads also work well for classic styles. Whether you’re using Swarovski cubes for projects that you intend to keep for yourself or you’re creating jewelry pieces for those you care about, it’s important to clean the beads regularly. Proper cleaning ensures the beads maintain their beauty and luster. The most important tip to remember when cleaning your crystal beads is to never use a harsh soap or detergent. Instead, you'll want to use a mild soap with lukewarm water. Do remember that although these crystals boast such sparkle, they are easy to chip, so you'll want to be extra careful to ensure they don't become damaged during the cleaning process. The recommended way to clean your Swarovski cubes is to fill a small bowl nearly to the top with water. Add in a couple teaspoons of gentle dishwashing soap and make the water soapy. Next, wet a smooth dish cloth with the soap and water and gently wipe down your beads. If possible, you should remove the beads from their settings. However, if they are in a jewelry cluster or glued onto a surface, removal won't be possible. If needed, you can always use a small Q-tip to clean your beads. This is especially ideal for jewelry pieces where the beads are secured in a setting. You can use the Q-tip to remove grime and dirt around the setting. After you are finished cleaning the beads, you'll want to rinse them with water and let them air dry. Another excellent cleaning substance to use is ammonia. You will, however, want to make sure you don't add any more than a teaspoon per 10 cups of water. Anything more potent could possibly cause your jewelry to lose its luster. 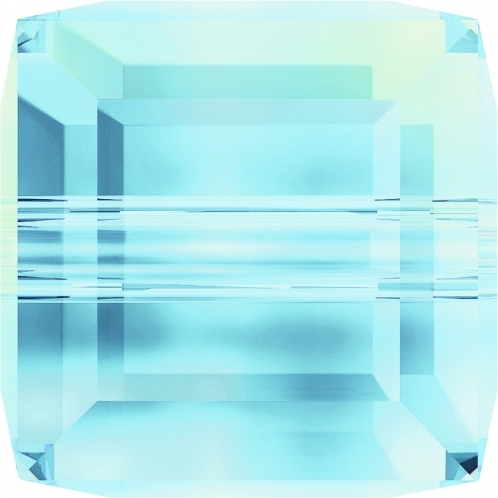 No matter the jewelry piece you want to make or the item you want to embellish, Swarovski cubes will look great. It’s very popular to accentuate the Cube Beads with Swarovski Crystal Squaredelle Beads. They perfectly complement each other adding a touch of colorful sparkle with gold or silver accents. The crystal cube beads are an ideal way to accessorize any outfit, and when it comes to gift giving, they simplify creating unique gifts for all of your loved ones. For all of your Swarovski crystal cube beads, visit Rainbows of Light. Our wide selection of sizes, shapes and colors will ensure you find just what your need for your unique design, at a price you can afford.